Aranda writes that Conabia is a select and secretive group that decides which seeds are approved yet avoids responsibility for the resulting impacts: massive use of agrochemicals, land clearance, evictions, and health conditions. They are presented as “scientists”, “technicians” or “experts”, and hide their links with the companies that produce transgenics. Conabia was created on October 24, 1991, when the government of Carlos Menem made the decision to introduce GM crops in Argentina. It defined its profile as “scientific-technical”. Its composition was kept secret until 2014, when the information was leaked to MU, the magazine of the cooperative organization Lavaca. 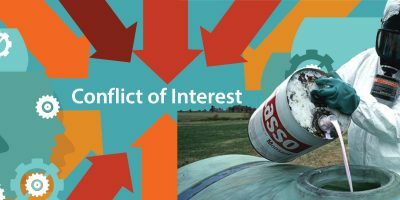 Of 47 members, more than half (27) were employed by GMO seed companies and had conflicts of interest. Last year the Commission celebrated its 25th anniversary. As part of the festivities, they announced “the approval of two biotechnological events”, according to a notice put out by the Ministry of Agroindustry on November 2, 2016. The Secretary for Added Value [sic. – El secretario de Agregado de Valor], Néstor Roulet, stressed “the contribution of Conabia to the technological development of agricultural activity”. The celebration was held at the Buenos Aires Cereals Exchange. There they approved new soybean and corn seeds tolerant to the herbicides 2,4-D, glyphosate and glufosinate ammonium. The beneficiary was the US company Dow AgroScience. Lema does not talk to the press. MU attempted to interview him repeatedly, but only once did he propose a meeting, specifying that there must be no recording or note-taking. “I want to clarify some things”, he said. MU insisted that it would only agree to meet for the purposes of an interview. The meeting was never held. “guarantees the safety for the environment and for people of all products used in the Argentine countryside”. He said that the criticisms of GM crops originate from “those who spread disinformation because they serve various interests and have a political agenda”. Lema welcomed the fact that Argentina is the third biggest grower of GMOs after the United States and Brazil. “This week two more soybean events were approved. Close to 40 have been authorized in the country, a third of them under my mandate,” he said. And he described the future: GMO “trees that produce better wood, improved flowers, more nutritious rice and plants resistant to drought”. * Natalia Ceballos Ríos. General Coordinator of the Biotechnology Group or “Bio Group”, which includes and is financed by seed companies, cereal firms and agrochemical companies such as Monsanto, Bayer, Syngenta, Dow, and Pioneer/DuPont, among others. * Claudio Gabriel Robredo, Monsanto’s “director of regulatory affairs” between 2000 and 2011. He currently owns his own company, AgroReg, where he provides “advisory and management services in the crop and seeds regulatory area”. AgroReg is a member of ASA (Asociación de Semilleros Argentinos/Association of Seed Companies of Argentina). * Mariano Devoto, agricultural engineer and professor of botany at the Faculty of Agronomy of the University of Buenos Aires (UBA). He works within the framework of an agreement with Syngenta in the research project, “Pollination of soybeans: a study at different scales”. * Santiago D’Alessio, director of wildlife at the Undersecretariat of Planning and Environmental Policy of the Nation. 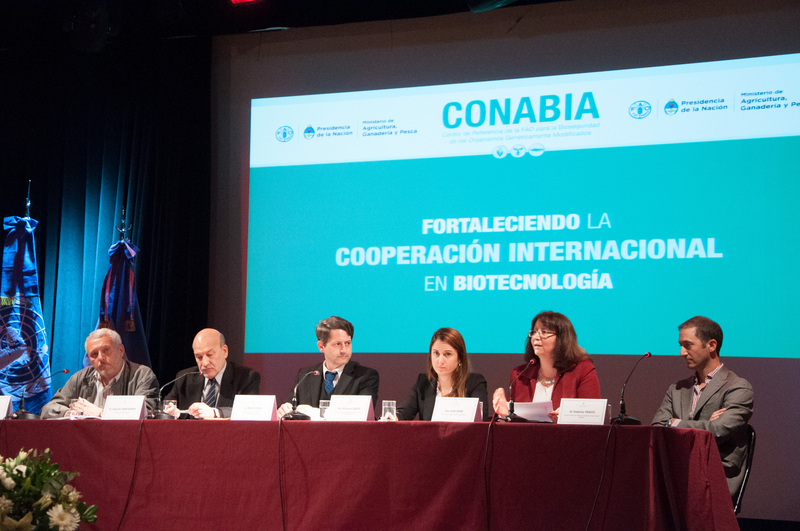 * Mauro Meier, of the Argentine Cooperatives Association (la Asociación de Cooperativas Argentinas), which defines itself as “one of the main grain operators in the country in the commercialization of cereals and oilseeds”. It’s part of the GMO industry. * Dalia Marcela Lewi (INTA). Part of the Institute of Genetics of INTA. Author of the book Biotechnology and Plant Breeding II, with co-author Clara Rubinstein of Monsanto Argentina. He also investigated the resistance of transgenic maize to cold and salinity together with the agribusiness company Bioceres and was a member of ILSI’s Biotechnology Committee, along with researchers from Monsanto, Syngenta, Bayer and Dow Agrosciences. * Fernando Bravo Almonacid (Conicet) is an independent researcher at the Conicet Institute of Research in Genetic Engineering and Molecular Biology (Ingebi-UBA) and works on the genetic improvement of the potato. After six years of work, in 2013 he developed a new variety which is intended to be more resistant to viruses. In 2015 he obtained the approval of Conabia – of which he is himself a member – for a potato resistant to a virus. The company in charge of the transgenic potato is Tecnoplant, part of the Sidus Group. * Hugo Permingeat, of the Faculty of Agrarian Sciences of Rosario. As secretary general of the Faculty and along with the dean (Liliana Ramirez), he openly justified the private presence in the public university: “Monsanto trains its employees here. They are agronomists who provide them with postgraduate training and Monsanto values ​​the training we offer.” This was the way he justified the fact that Monsanto, Pioneer and Syngenta had “donated” a laboratory of biotechnology to the Faculty, along with equipment worth USD 300,000. In 2017 Conabia, which according to its official announcements supports “transparency”, has 34 members for the approval of GMO seeds. A large majority of them – 26 – belong to companies that produce GM crops or are scientists/entrepreneurs with conflicts of interest. If a university, research institute, social organization or journalist wants to access the approval dossiers for soybeans, maize, cotton or transgenic potatoes, they cannot: they are “confidential”.